Economy Portraits is a project I started for an Artist In Residence stay at the Huntington Beach Art Center from March 1 through April 9, 2011. I take portraits of anyone who comes into HBAC and ask them the question how has the collapse of the economy affected your life? I was interviewed by the Huntington Beach Independent newspaper, and the writer asked a question that has come up many times. “What inspired you to do this project?” The answer is annoyance. I am highly annoyed with the news about the American economy. One night I hear that the recession is over and jobs are coming back. The next night, there is a report that 4,000 workers have been laid off from a large corporation. I thought it would be interesting to find out from everyday people exactly what is going on. The project evolves in two phases. As I take the portraits, they hang from the ceiling of the gallery in rows, at eye level. 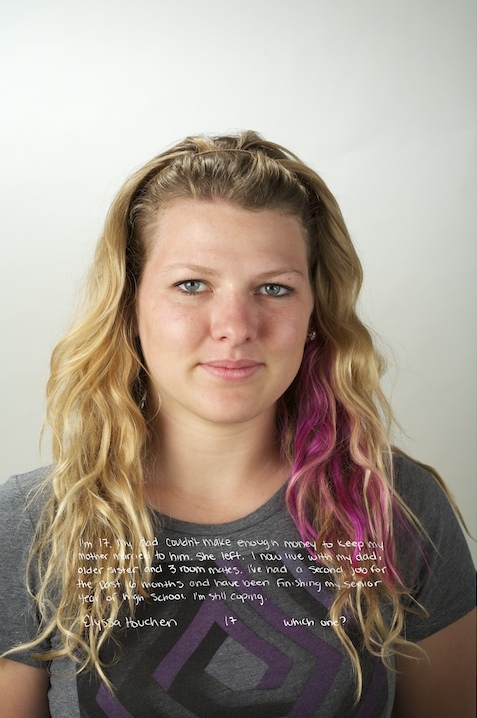 Each portrait has the answer to the question written in the person’s own handwriting. 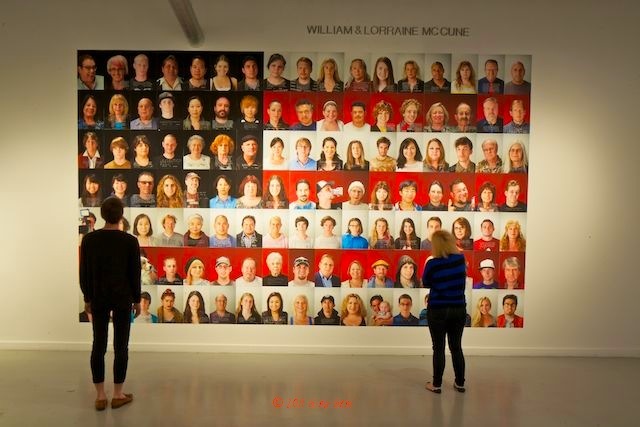 The portraits are photographed on three different colored backgrounds, red, white, and black. The purpose is to construct an American flag on the wall. I chose to use black instead of blue as a metaphor for our dark economic times. 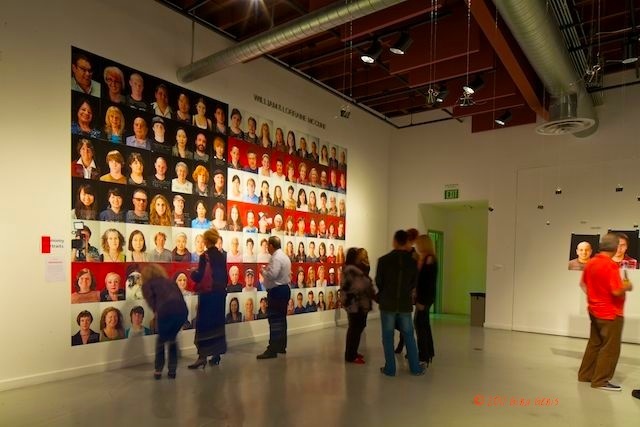 When the portraits fill the middle of the gallery, they are replaced by newly printed images. The first ones take their place on the wall. The American flag being built on the gallery wall. The completed flag measures 11 feet x 18 1/2 feet long. Early on during the reception. Participants are looking for their portraits. 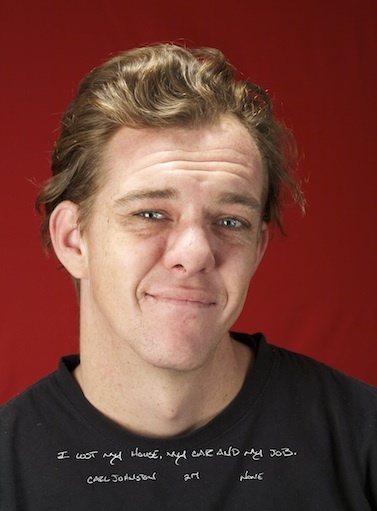 I photographed 245 people during the six-week residency. I thought the wall was big enough to use all the portraits, but it turns out a wall looks a lot larger when you see it in an empty room. I used less than half of the portraits to make a flag that measures 11 feet high by 18 1/2 feet long. I hope to take Economy Portraits to a museum that has a space that will accommodate a full flag with all 50 stars and 13 stripes. To view a two minute video of the making of the portraits and flag, click here to view on YouTube. A book of this project is available on Amazon, or through my website. 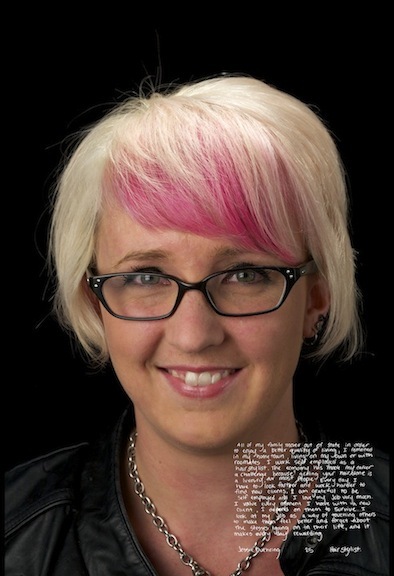 To read an article about Economy Portraits in the Huntington Beach Independent newspaper, click here. Afterword: On April 18, I gave a short speech to the Huntington Beach City Council. As in all cities of California, a serious budget crisis puts the Huntington Beach Art Center at risk of being closed down. Click here to read the speech. 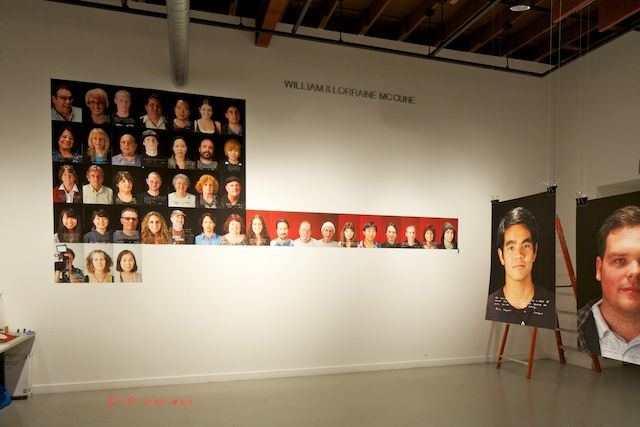 Economy Portraits was awarded “Best Art Show of 2011” by OC Weekly. See the article by clicking here. 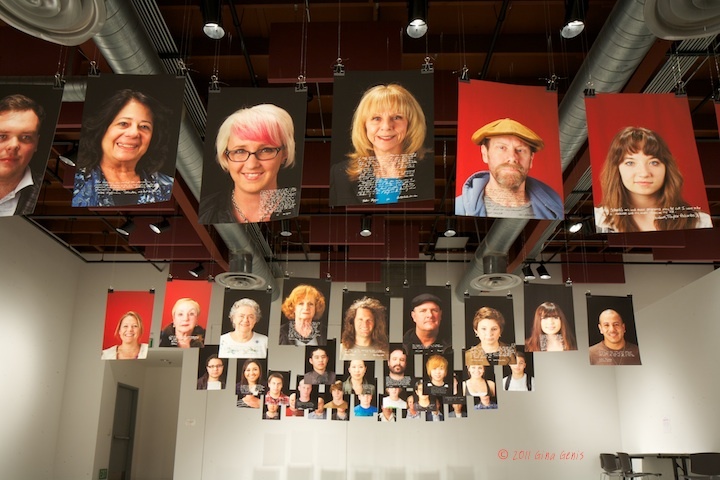 Update: Economy Portraits is on exhibit at Orange County Center of Contemporary Art (OCCCA) from August 5 – 18, 2012 in an exhibit titled The Spirit of Democracy. Opening reception is August 4th from 6 – 10 p.m. Click here to see a short video of the opening reception on YouTube. Next exhibit of Economy Portraits will be a smaller version of the flag in an exhibit titled “Capital Crime$” at BC Space in Laguna Beach. The show runs from October 6 – November 30, 2012. Posted in Art Galleries, Awards, Cameras, Digital Photography, documentary photography, Exhibits, Fine Art, fine art photography, Museums, Photography, Photography Equipment, Photojournalism, Teachers and tagged American economy, Art, Artist in residence, economic collapse, economy portraits, economy portraits flag, Fine art, gina genis flag, Huntington Beach California, Huntington Beach Independent, job loss california, OCCCA, Orange County Center for Contemporary Art, Photographers, Photography, Portrait. Bookmark the permalink.